(FASTNEWS|COLOMBO) – The Minister of Industry and Commerce has claimed Rs. 1 billion compensation with regard to a statement broadcasted on a local television channel that allegedly damaged his image, reputation and good will. 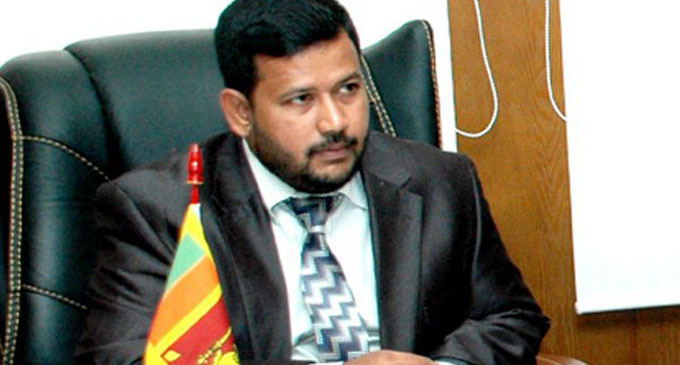 In a letter of demand sent by the Minister of Industry and Commerce, Resettlement of Protracted Displaced Persons, and Cooperative Development Rishad Bathiudeen through the Attorney-at-Law Shandheepa Gamaathige, Minister Bathiudeen said that a statement by the Secretary of Association of Information Technology Professionals, Lasantha Wickramasinghe, on a prime television news telecasted on 06 February, was false and defamatory. “I act for and write on the instructions of my client Honourable Minister Rishad Bathiudeen of No. 73/1, Galle Road, Colombo 03, the Honourable Minister of Industries and Commerce, Resettlement of Protracted Displaced Persons, and Co-operative Development of Sri Lanka. I am instructed to state that my client is the Leader of All Ceylon Makkal Congress (ACMC) a recognised political party and a Cabinet Minister. He is held in high esteem and dignity by the general public and this has been reflected in him being repeatedly elected by the people of the Wanni District as their Representative in Parliament. I am instructed that on or around 06/02/2019 in the ‘Hiru TV’ channel prime news telecasted by you along with Mr. Lasantha Wickramasinghe, the Secretary of Association of Information Technology Professionals on this date which contains the false and defamatory statements. “Therefore, I am instructed to state that the contents of the said telecasting/ broadcasting is fundamentally false, wrong and have been published by you maliciously, and/or with reckless disregard for the truth and with the knowledge that the said publication will lower my client’s esteem in the eyes of the general public. As a result my client has been defamed and brought into disrepute. “Thereby I am instructed to state that in the said telecasting and/or broadcasting you have damaged and/or caused damage to the reputation and good will of my client who is a reputed and respected leader of the public. “I am instructed to state that my client has suffered immense and tremendous damage to his image, reputation and good will and my client estimates the damage caused at Rupee One Billion (Rs. 1,000,000,000). “Therefore I have been instructed to demand and I hereby demand the payment of the said sum of Rupees One Billion within fourteen-days from the date of this letter. On your failure to comply with this demand I have been instructed to institute legal action against you for the recovery of the said sum of Rupee One Billion together with costs and to assert all rights available to my client under the Law.